It takes a lot for a brand to blow me away but this season Kate Spade have done the impossible....not only have they presented a collection which has some of my favourite elements (lots of pink, rainbow stripes, glitter and a dash of whimsical) but they have accompanied it with one of my favourite campaigns of all times. Combining the gorgeous model Jordan Dunn with some of New York City’s finest characters to create a multi age and gender campaign that is amazing. Featuring fashion muse Iris Apfel (one of my idols); actress, model and photographer Syrie Moscowitz; fashion illustrator Robert W. Richards; artist, actress and model Anh Duong; author Karley Sciortino; and musician and composer Jon Batiste. The moment i saw Iris Apfel was going to be featured in another campaign they had me hooked, then i saw the bags and it was a match made in heaven. A beautiful collection centered around the pink mini rose print and rainbow coloured stripes with co-ordintating accessories, this assortment of styles is colourful, playful and fun - three words i would always use to describe Kate Spade. 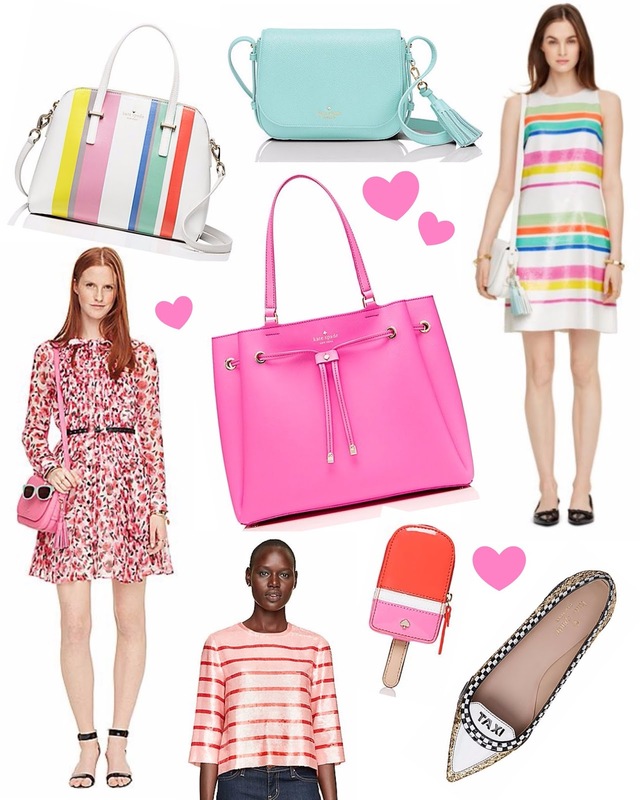 Now it wouldn't be a Kate Spade post without a round up of my current favourites on the website - although still quite early for the new SS16 collection, there are already a few pieces already grabbing my attention and causing the fashion voices in my head to chant "buy me" and as usual there are many bags on this list.... i love the bold solid colours within the pastel palette but also the injection of statement prints and lets be honest this collection features a lot of pink, my favourite colour so i am sold. Sadly my favourite piece - the pink skirt worn by Jordan Dunn above, isn't online yet but i love how it has been styled with the clashing breton stripe tee and biker jacket. The contrast of the uber feminine print and the tough jacket is a gorgeous look and one i would love to re-create. If i were allowed to pick only one item off my wishlist, it would have to be the Lynnie tote in tulip pink, as usual a classic shape in beautiful full grain leather but with some quirky touches such as the hot papaya lining and the backpack drawstring style detailing on the front. All of these elements make it a gorgeous functional piece, with just the right amount of wow factor. Check out all the new arrivals over on katespade.co.uk. adore these, the colors are amazing! Great selection, loved the bags.